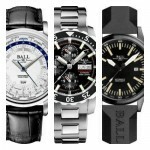 Hey everyone, today we’re taking a look at 5 of the best Ball watches for men. 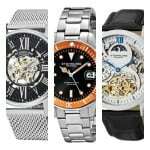 It’s just a little list today, I don’t often feature watches that are this expensive, but today I felt like showcasing the brand a little. 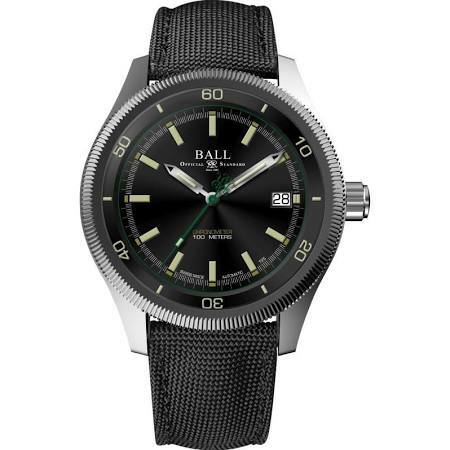 The Ball Watch Company is an American company that’s base in Switzerland. It was founded by Webb C. Ball in 1891 in Cleveland, Ohio. It has a history that’s strongly linked to the development of the American railroad. 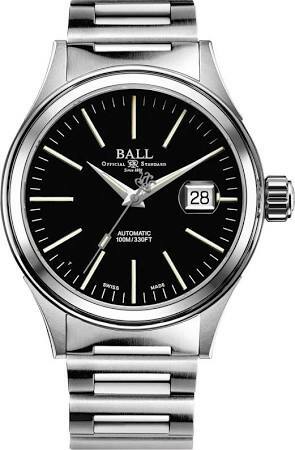 You can learn more about the history of the Ball Watch Company on this Wiki page. 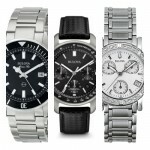 I hope you enjoy today’s list on 5 of the most popular Ball watches for men. Let me know your favourite in the comments section at the end. First up in our list of the best Ball watches for men is The Magneto is the pinnacle of Ball Watch Company’s research into producing superior magnetic repellent timepieces. For a watch to be classed as antimagnetic, it has to be able ti withstand a magnetic force of 4,800A/m without affecting its timekeeping accuracy by more than 30 seconds a day. This Magneto S absolutely trumps that by remaining fully functioning at up to 80,000A/m. The watch features a Chronometer specification with its Swiss automatic RR1003-CSL movement. It features a sapphire crystal glass for excellent scratch resistant and also has a 100m water resistance rating. The dial has a high visibility design with extremely good lume coating the hands and hour markers. One of my favourite features of this Ball watch is the exhibition caseback that allows you to take a peek at the inner workings of the automatic movement. Next up we have a very handsome looking gents Ball Trainmaster Eternity watch. It had a stainless steel casing and runs on a Swiss automatic movement, the RR1102. It’s a little hard to tell from the picture but that’s a dark brown genuine leather strap. 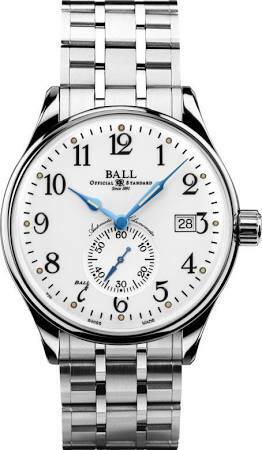 Extra features of this Ball Trainmaster include an exhibition caseback, one of my favourite features on a watch. As well as a sapphire crystal glass for excellent scratch resistance, and a day and date display on the dial. Speaking of the dial, it features a good coating of lume on the hands and hour markers, making them very easy to read in dim lit conditions. The water resistance rating of this timepiece isn’t exactly anything to get excited about, it’s a simple 30m rating. Here we have another popular Ball watch. 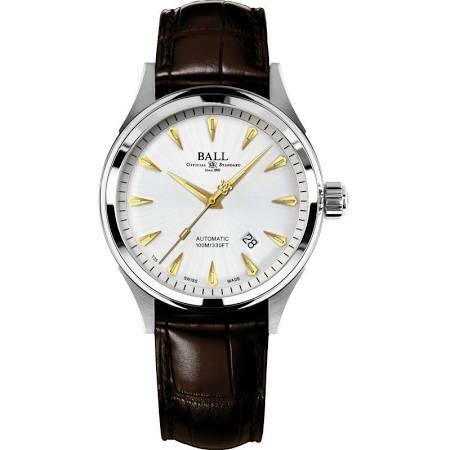 This is the Ball Fireman Racer, a classic automatic watch with a stainless steel casing. Powering the watch is a Ball RR1103 automatic 25 jewel movement. It has a 38 hour power reserve and a frequency of 28,800 BPH giving it a really smooth movement. I like the interesting finish of the dial, the hands and hour markers really stand out against the white background. There’s also a useful date display located between the 4 and 5 o’clock hour markers. This model has a decent 100m water resistance rating and is fitted with an anti-reflective sapphire crystal glass for excellent scratch protection. It’s fitted with a soft genuine leather brown strap for extra comfort as well. In at number 4 we have this beautiful classic looking timepiece with some blue detailing added to the dial with the watch hands. The Trainmaster Standard Time model was inspired by the pocket watches on the 19th century, something I think you can spot quite easily with the dial design. You end up with this brilliant combination of 19th-century vintage style and cutting-edge technology. It features a high-end automatic Chronometer movement, caliber RR1105-C. The watch also features luminescent hands, a sapphire crystal glass, and a exhibition style caseback. This is about as close as it gets to an affordable Ball watch, it’s still a high-end expensive timepiece though. 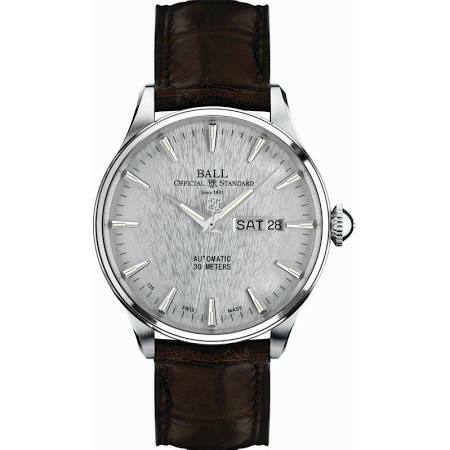 This is another classic looking timepiece from Ball with a stainless steel casing measuring 39mm in diameter. It’s powered by a Swiss made automatic movement and features a 100m water resistance rating. The dial has this easy to read design and the slim hands and hour markers are coated with lume for high visibility in dim lit conditions. 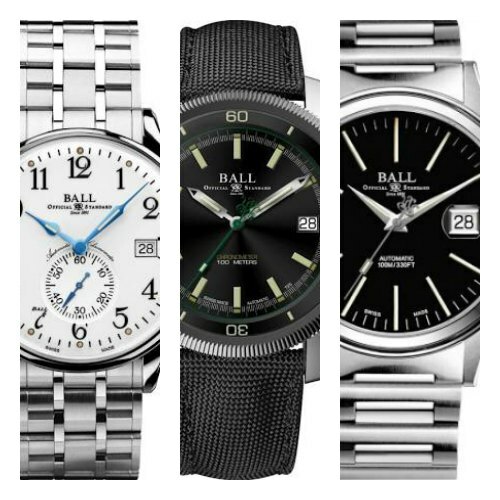 Thanks for taking the time to check out today’s top 5 best Ball watches for men. My personal favourite has to be number 4, I like the blue detailing on the dial as it makes the watch stand out a bit. What was your favourite? Let me know below.